The crickets are chirping all around me, looking around the dark woods surrounding me I peer into the fog staring out into the beautiful nighttime landscape. I look down at the underbrush around my feet and find a place to sit down on the cool ground, taking the time to examine the ferns around me. I lay down completely, staring up into the night sky flecked with stars with a shining full moon illuminating the night sky. Staring up, I lose myself for a moment in the fireflies fluttering around my view. After what felt like an eternity, I stood up, and reexamined my surroundings. A foggy clearing caught my eye, and as I stared into it I hear a rustle coming from the bushes to my right. I whipped around to find where the sound came from, and again heard a rustle, only this time I see some shadowy figure poke its head up in the distance. My heart begins to race as the rustles get closer… something was coming. Whipping my head around searching for the figure I had seen before, I felt myself tense up a little bit, I had no idea what to expect, but I knew it was coming my way. Suddenly to my left this time the figure emerged from the bushes again, sticking up it’s head and wailing into the empty night. But it wasn’t a territorial wail, but rather something sadder, the sound of an animal that had lost it’s pack perhaps? As quickly as it had appeared the head disappeared again into the brush, but the loud skittering noise it made as it moved through the forest was definitely getting closer. A tense moment of silence passed, before the figure finally burst into the foggy clearing. Now fully in the moonlight, I was able to make out the figures full shape; and to my surprise, what I saw ahead was a giant robotic hand. The “head” I had been seeing in the brush earlier turned out to be the index finger of the hand, which was currently sniffing around the clearing, clearly searching for something. Was it me that it was looking for? I crouched down in the bushes, trying to hide from the mechanical beast which was both cute and terrifying at the same time. As it continued to search, it let out another wail into the night sky. Only this time, it was answered. And then suddenly the scene faded to black, and credits began to roll. Finally shifting back to reality, my heart began to settle, but I longed to return to the magical world I had just participated in, and have adventures with my new robot friend. The experience may have been paced at my own discretion, but it felt all to short. The world I had participated in was so full of life and detail I probably could have spent hours in the experience, which was made all the better by the incredible display and motion tracking of the Crescent Bay. 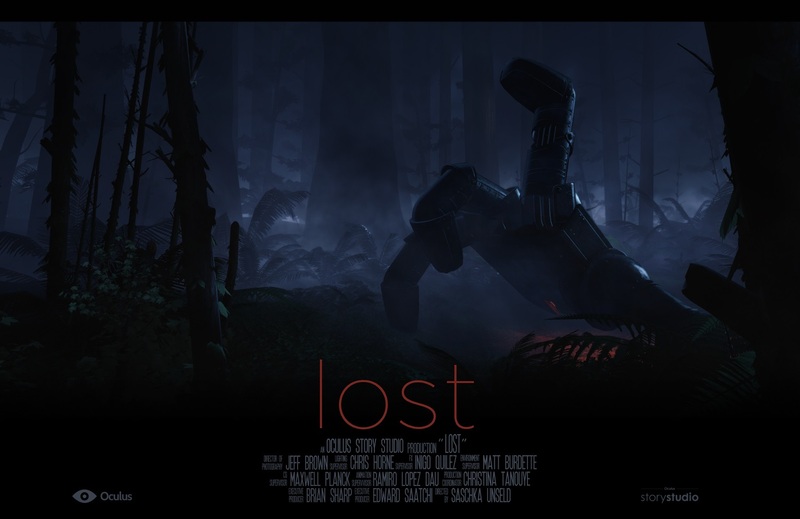 “Lost,” as the experience was called, was hauntingly beautiful and was one of my favorite experiences in VR thus far. The sense of immersive wonder that I experienced during this short was almost childlike. I could feel my jaw drop open wide at multiple different parts during the demo. The fact that it was an obvious homage to Iron Giant, easily one of my favorite non-Ghibli animated films ever, was just icing on the cake. The experience made incredible use of both visuals and sound. When I was laying on the ground (thanks to the vastly improved positional tracking over the DK2) I was able to look at the individual leaves, sticks, and pine needles that littered the ground around me. The ferns on the ground by my feet swayed with a soft breeze that quitely was perfectly tracked in a 3D audio space, thanks to the newly integrated RealSpace 3D audio from Visisonics. The team also made excellent use of sound and lighting cues to help direct my gaze as the action unfolded around me. There may still be some things to discover in terms of narrative structure in VR, but in this short vignette the story felt incredibly well paced, and I never once felt removed from the experience. It was the longest, most consistent sense of presence I had felt in VR to date, exceeding the high expectations set by the Crescent Bay demos at CES. I have high hopes for the continued development of Oculus Story Studio, and look forward to seeing how this structure plays over a feature length presentation. In 1986, Pixar had Luxo Jr. now in 2015, Oculus has Lost.